A special festival just for mums and their children will be held at the Forest and Beach Centre in Beeson in September. This entry was posted in Events/Meetings, News on June 13, 2017 by Transition Tavistock. LETS (Local Exchange Trading Schemes) is a way of exchanging goods & services with other people in the community without the need for money. LETS help regenerate communities and rebuild the local economy. There are many LETS Schemes running successfully throughout the world. The kick-off meeting for the newly-formed Tamar Valley LETS was held in Kingdon House in Tavistock on 17 May. Robin Williams (local coordinator) and Rob Follett (Falmouth LETS) gave a presentation to introduce the concept to the audience. Since that meeting Rob Follett has created the website for Tamar Valley LETS. The main purpose of this site is to enable members to keep track of credits (“Tams”) they earn when trading goods and services. On the homepage of this website a link to an application form can be found. People wishing to join LETS should download this form, complete it, and post it to Robin Williams. They will then be given higher-level access to the site to enable them to begin trading. This entry was posted in Local Money, News on June 13, 2017 by Transition Tavistock. Rethinking Work and Income is the title of this free evening workshop at Plymouth School of Creative Arts. Thanks to Ed Whitelaw for providing this information via Pat Bushell for Transition Plymouth. Tamar Energy Community and West Devon Borough Council are getting behind a new pilot project to help local residents save energy and money in their homes. The Local Energy Advice Programme (LEAP) provides residents with a free home visit from a trained energy adviser who provides advice and support to make the home as energy efficient as possible. This entry was posted in Uncategorized on June 11, 2017 by Transition Tavistock. We all want to save for a rainy day. But what if our savings are causing the storm? Find out more here or call into Local Matters to add your comments to the Banking System. This entry was posted in Local Money, News on May 9, 2017 by Transition Tavistock. Have you heard of LETS – the Local Exchange and Trading System? It’s coming to Tavistock soon, so climb aboard and improve your quality of life. The concept has been around for decades but now exchanging and trading your goods and services has been made easy due to user-friendly software that keeps track of credit points earned by LETS members. The points for a traded good or service normally reflect its equivalent Sterling value so, for example, an hour of tutoring would earn a member 25 points – as £25 is a typical charge for this service. Everyone has something to offer. You can mow someone’s lawn, dog sit, trade fruit and veg grown in your garden, lend out a specialised tool, drive another member to a local airport, etc. The list is endless. A meeting will be held in the “Studio” in Kingdon House, Pym St, Tavistock, PL19 0AW on Wednesday, 17th May from 14:00 to 16:00 to explain LETS in more detail. Rob Follett of the highly successful Falmouth LETS group will be on hand to demonstrate the functionality of the LETS software. Robin Williams, a Tavistock resident, will lead the discussion. His immediate goal is to form a committee of volunteers to create a plan for a local group. If you’d like to know more about various forms of Local Money check out the Transition Network’s 2010 publication ‘Local Money. How to make it happen in your community’. This entry was posted in Events/Meetings, Local Money, News on May 9, 2017 by Transition Tavistock. Tavistock’s first Seed Swap was a great success on Saturday 8th April. We had just over a hundred visitors dropping into Local Matters for seeds, advice and a chat. We’d like to thank Rob and Diana from Holsworthy Organics for helping us offer a great range of seeds; and to all the local allotment holders and other local growers who bought in seeds to share. The courgette seeds seemed to be very popular and were snapped up quickly. If you missed it, we still have seeds to share at Local Matters (Elbow Lane, Tavistock) every day (except Sundays and Bank Holiday Mondays) between 11:00 and 13:00. If you don’t have any to swap, or just too many to use yourself you can always drop them in so others can benefit. We’re also really keen to hear your growing tips. Come and add them to our ‘greenboard’ or email hello@tamarenergycommunity.com or call 07969 569 444. This entry was posted in News on April 17, 2017 by Roz Catlow. 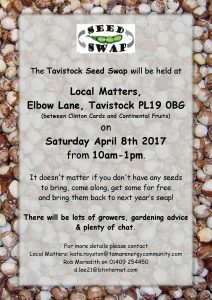 Join us between 10.00am and 13.00pm on Saturday 8th April at Local Matters.for the first ever Tavistock Seed Swap! It doesn’t matter if you don’t have any seeds to bring, come along, get some for free and bring them back to next year’s swap! There will be lots of growers, gardening advice & plenty of chat. This entry was posted in Events/Meetings, News on April 1, 2017 by Roz Catlow. Totally Locally Tavistock launches Fiver Fest on Saturday 1st April. Lots of special offers for just £5 from independent traders in the town. So far, 36 businesses are taking part! Check out the Totally Locally Facebook page or read about the offers on page 17 in the Tavistock Times Gazette (30th March issue). This entry was posted in Uncategorized on April 1, 2017 by Roz Catlow. A 2 hour (approx.) 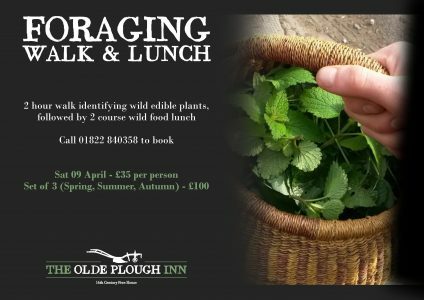 walk learning how to identify wild edible spring plants, that are growing in the hedgerow and riverside, and the poisonous plants you could mistake them for. Ending with a delicious meal at The Old Plough Inn sampling the wild food we find. This entry was posted in Events/Meetings, News on March 28, 2017 by Roz Catlow.